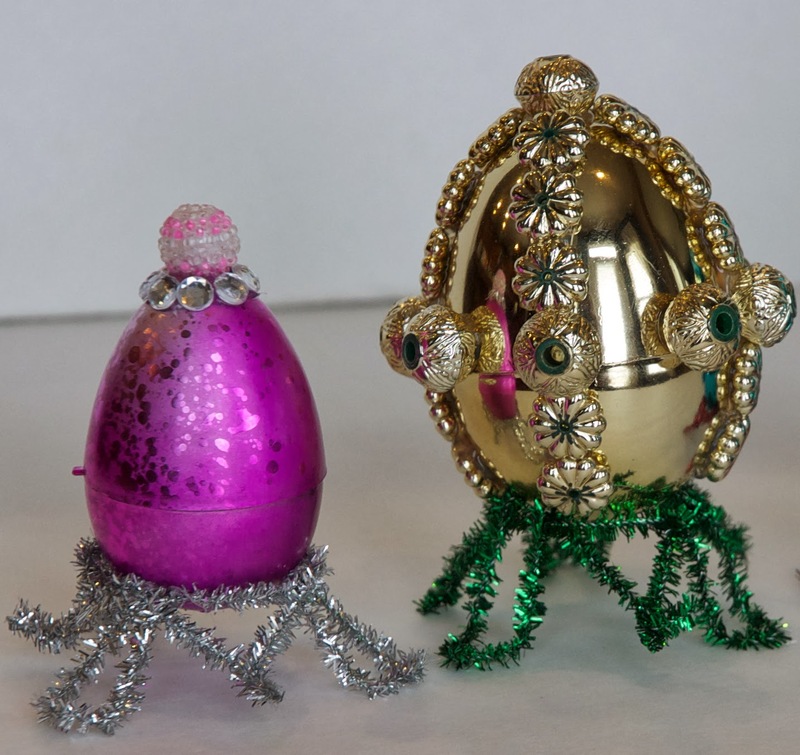 Faberge style eggs have been popular for over 100 years, and now you can have the look at home for next to nothing. 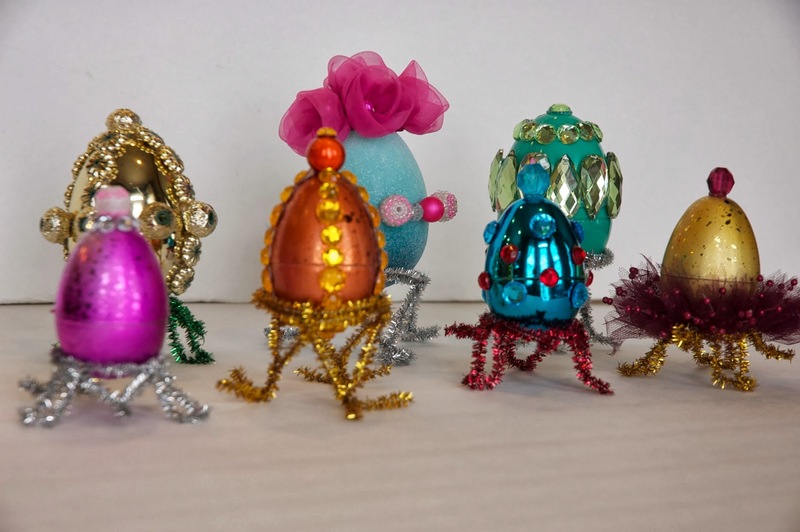 I got my Easter box out of the garage, and pulled a few eggs out that looked metallic. Next, I went to my craft supplies, and got out my beads, jewels, and small fake flowers. I used a hot glue gun for this project. It was fun to see each one come together. I can't decide which one I like the best. The thing that really makes them is the base. Make one of the halves into a circle that will hold your egg. 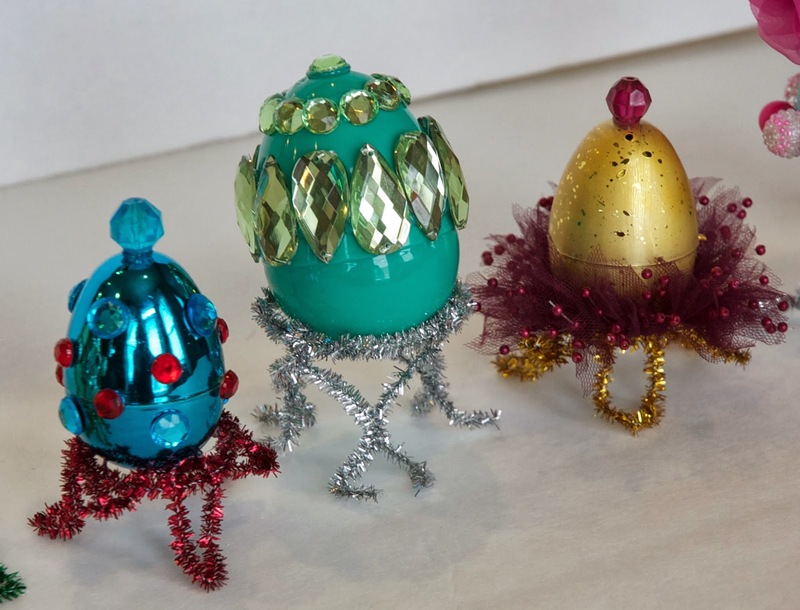 You can use a whole pipe cleaner, if your egg is heavy and you feel like you need extra support or have a large egg. Wrap the ends around the circle to secure. For the legs, fold each of the three remaining pipe cleaners in half and in half again. Insert the circle at the fold. Separate the legs, and twist the open ends together. Bend legs to desired shape. Secure with hot glue if it needs it. You will need 3 pipe cleaners. Cut two pipe cleaners in half. 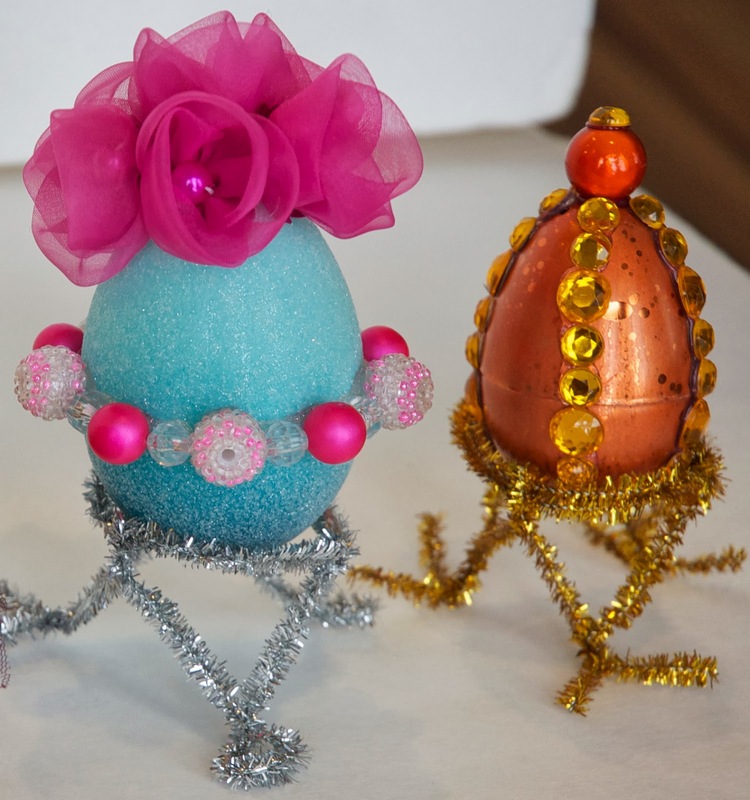 Make the large pipe cleaner into the circle that will hold your egg. Wrap the ends around each other to secure. For the legs, fold three of the short pipe cleaners in half. Insert the circle to the fold, and twist the legs at the circle to secure. Divide the legs, and twist around each other. Pull the legs apart, and twist where the legs meet. You can see in the picture above, how the pipe cleaners meet at the bottom, and have been twisted together. I had the silver base meet up again, and left the gold, "feet," open. Bend into your preferred shape, and set your egg on top. Hot glue in place if you feel like you need to. 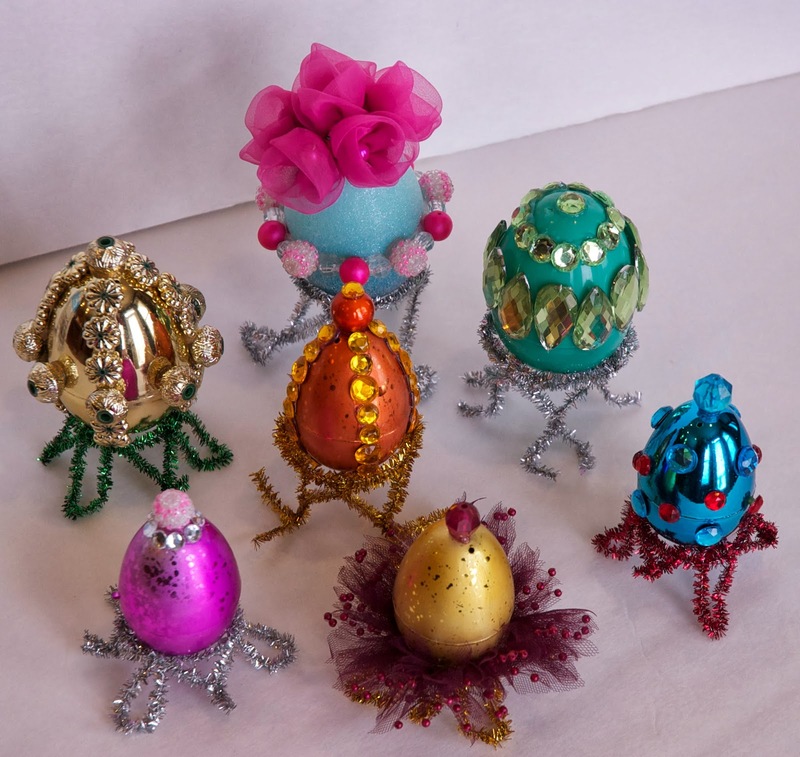 I hot glued all my eggs. 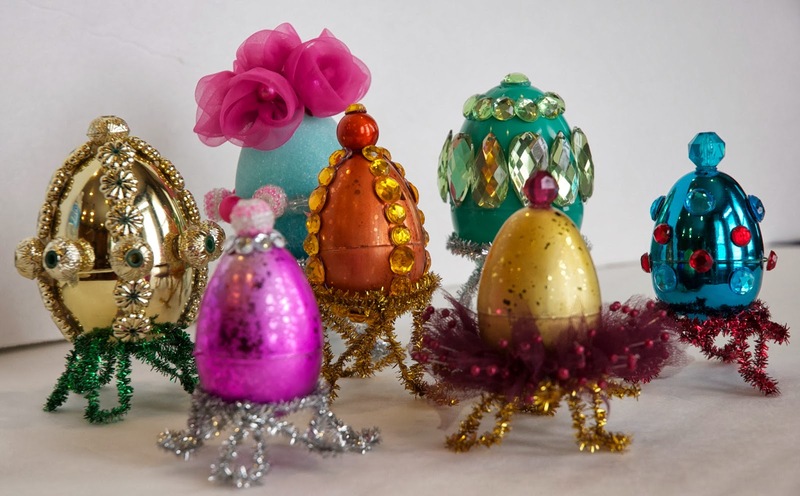 When I arrived at Studio 5 yesterday, Tiffany was helping me get my bins out of the car, and was worried about damaging the eggs because they look so lifelike! Haha. 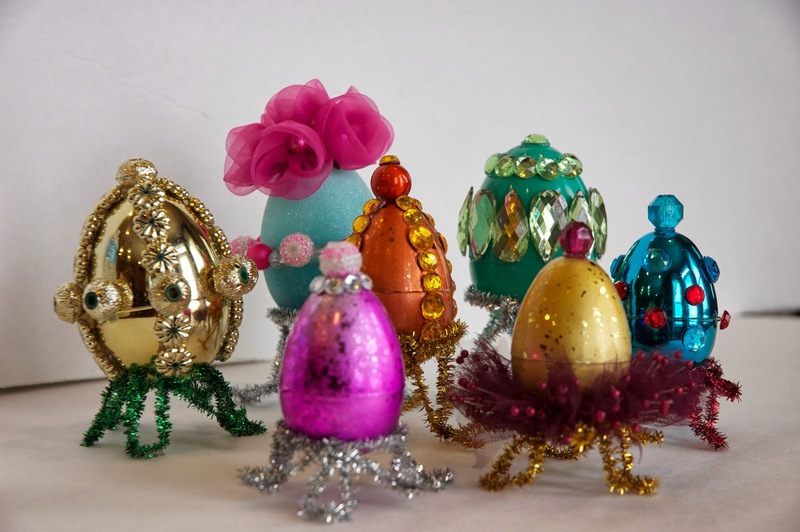 Just goes to show what old Easter eggs, jewels, pipe cleaners and hot glue can do! Proof glamorous doesn't need to be expensive ! Brilliant !